In an anti-climax to the series on the Triumph Acclaim, we summarise the legendary LJKS’s first review of the car for Car Magazine. Oddly, Car failed to feature BL’s Triumphant Acclaim on the cover of its issue in which LJKS’s legendary review appeared (Source: Pinterest). In this third chapter, we find out more about the fruit of the Bounty, and review some of the prose written by esteemed journalists on the cuckoo Triumph. “The Triumph Acclaim is a good replacement for the aging Dolomite. It is fast, comfortable, economical, and should be very reliable. Providing that the self-imposed restrictions of Japanese imports remain, the car should produce a handsome return for BL, but if cars like the excellent four door Accord become readily available, will people be prepared to accept less Honda for about the same price?” AutoTEST, Autocar, w/e 24 October 1981 (BC – Before Cropley!). A review of technical specifications reveals that there is little that is remarkable about the three box, four door, saloon that was launched as the Triumph Acclaim on the 7th of October 1981. It had a modern, 1,335cc, four cylinder engine with eight valves and a single overhead camshaft, driving the front wheels via a 5 speed all synchromesh gearbox. The chassis was a steel monocoque, with a suspension system of coil springs over independent MacPherson struts and an anti-roll bar at the front. Author S.V. RobinsonPosted on 4 Jul 2018 4 Jul 2018 Categories British Leyland, The History, The Industry, TriumphTags Austin Allegro, Autocar, Car Magazine, LJK Setright, Morris Ital, Triumph Dolomite3 Comments on Critical Acclaim? It’s the One From Tokyo, Not Mars. In the previous instalment, we outlined how BL, under the driving ambition of Michael Edwardes, got in step with Honda, to collaborate on a new model. This time, we focus on the car itself and the choice of manufacturing plant, which took on almost as much significance. In spite of claims at the time, BL’s ‘advanced’ paint and rust-proofing technology failed to prevent the Acclaim succumbing to the curse of the tin worm. “According to Ian Forster, the men from Honda, who have been worried by problems with ‘orange peel’ in the paintwork of their own cars, are learning to minimise it by adopting BL’s techniques.” Steve Cropley, Editor, Car Magazine. The choice of model for Project Bounty, it seems, was largely determined by Honda. Hattori Yoshi (Car, November 1980) explains, “But why did BL pick the Ballade? Well, they didn’t. The fact is that BL picked Honda as being the Japanese company with the most compatible technology and went cap in hand in search for a car – any car – to help them keep going. Author S.V. RobinsonPosted on 22 Jun 2018 21 Jun 2018 Categories Car Culture, Honda, The History, The Industry, TriumphTags Acclaim, BL, Car Magazine, Cowley, Honda Ballade, LJK Setright, Manufacturing, Project Bounty, Sir Michael Edwardes9 Comments on It’s the One From Tokyo, Not Mars. As the eighties progressed and those who could preferred to flaunt it, the W126 began to fall out of favour and, for the very first time, began to feel threatened. The nature of the market during the late 1970s and early ‘80s played a crucial role in the unique process that lead to the W126’s creation. It is, for example, very hard to believe today’s clientele would accept a flagship modell with significantly reduced output figures compared with its predecessor – yet after a decade of fears of fuel shortages, even the most wealthy and conspicuously consuming of customers were willing to accept a certain amount of modesty. Theme: Books – Drive On! 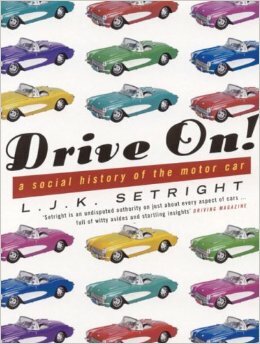 Not very many books on cars demand as much as LJK Setright’s social history of the motor car. It offers a lot in return though. 2004: Drive On! by LJK Setright. Author richard herriottPosted on 4 Nov 2014 29 Aug 2018 Categories Books Theme, Car Culture, Monthly ThemesTags "Drive On! ", LJK Setright5 Comments on Theme: Books – Drive On!